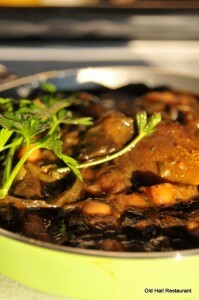 Ghormeh sabzi is a Persian herb stew. It is a popular dish in current day Iran, Iraq, and Azerbaijan; traditional and very popular, served when family members return home after being away. Ghormeh means stewed and sabzi literally means greens, which is herbs in English. The main ingredients are a variety of sauteed herbs, mainly spinach, parsley, spring onions, fresh coriander; seasoned with the key herb, dried fenugreek leaves (called shambalileh in Persian), which gives it the peculiar flavour. 1 cup of pre-soaked Rose coco beans, (Borlotti beans, Saluggia beans, Roman beans, Crab Eye Beans); alternatively you can use red kidney beans! Add salt, pepper and turmeric and continue for a few more minutes. Add the lime juice, blend and serve over pollo. Alternatively eat with Naan-e-Barbarri or Lavaash. post a comment 😉 I actually do have some questions for you if you tend not to mind. As Spring (Norooz) is here I am always in the mood to make some of my husbands favorite recipes. So thank you for your posting of this recipe, my husband would whole heartedly approve! Hi in procedure you say add Dill but you did not list in ingredients? Error? Thank you so much for your comment! Yes, I did and it is optional. If you would like to omit, it will not make a vast difference to your end product! IF YOU WANT TO MAKE THIS BUT DON’T HAVE ALL THE INGREDIENTS or DON’T LIKE FENUGREEK PLEASE READ THIS COMMENT. Thanks for posting this recipe! I enjoy eating Gormeh Sabzi and I appreciate the technique that keeps the greens from being overcooked. I have been practicing Persian/Armenian cooking for the past 1 3/4 yrs, living with an Armenian Iranian. He generally likes what I do. He does not care for fenugreek, and while I love the stuff, I’ve been looking for a substitution for Gormeh Sabzi, which still enhances the flavor, so I can make it for him, too, and a substitute for dried limes, because they’re expensive in the U.S. (until I get my dehydrator…). -I found that powdered horseradish root rounds out the parsley and turmeric in a rather delightful way, adding a bit of the same bite as the fenugreek seed. -I also have added dried summer savory and oregano with pleasant results, as a substitute for the fenugreek leaves. For me, the taste of parsley gets rather strong when I use as much of the fresh herb as I like. The dried herbs balance that out nicely. -I like to pickle diced lemon rind in a salt brine, any time I juice lemons, to serve as a tangy relish. I added about a tablespoon of the lemon rind and about 3/4 cup of the brine to a pot following the above proportions in your recipe. I also have made this with kale, since I buy it more often than spinach and sometimes decide I want this dish on the spur of the moment (as I did, today) when figuring out what to do with soaked beans. I hope this comment is helpful to other aspiring Persian cuisine aficionados.